Top 10 Paul Scholes goals – Which is your favourite? Over his 17 year Manchester United career, Paul Scholes knocked in 150 goals in 676 appearances for the club and some of those goals will go down forever in the memory of not just every United fan but any appreciative football fan. His official announcement to retire this morning has left a stark realisation of changing times at United this summer and we will be a very busy team in the transfer window as we look to fill the gaps in our midfield as the challenge of overcoming Barcelona. I’ll take a look over 10 of the best Paul Scholes goals, in no particular order, and leave it up to you to cast your vote on which you think is his best. Barcelona have mastered the wizardry of the passing game but Manchester United and Paul Scholes had been there before. During the times when the Champions League had 2 group stages, this goal is not only a great individual effort from Paul as he delicately chips the keeper but it comes off the back of a patient team passing move that involved over 20 successive passes from a United team that were Champions of Europe at the time. A truly wonderful goal for many reasons. Now, this one is really special and for me, is my favourite Paul Scholes goal. Hit with such beautiful timing and precision, this 30 yard volley puts shame to most free kicks. I have no idea how Paul managed to get such control on a ball that was dropping from such a height but he did it with such ferocity that the keeper had absolutely no chance even though he got a hand to it. Shots like these became the trademark for Scholes over the years and from seeing examples like this, it is not hard to see why. “What about that, what about that. 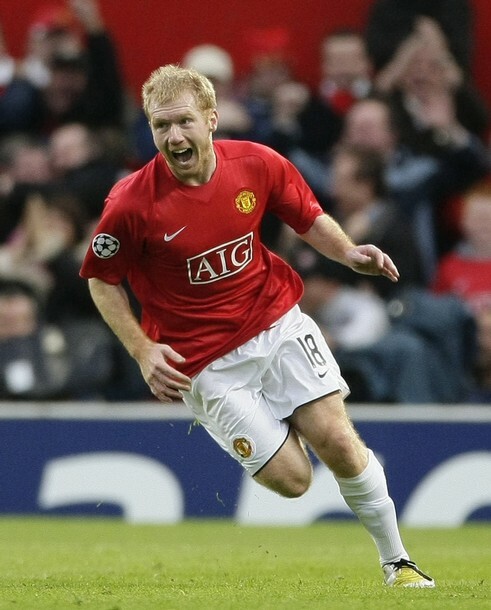 14 minutes gone, break-through for Manchester United.” Paul Scholes retires from as the leading English goalscorer in the Champions League and one of the finest midfielders of his generation. A goal in the semi-final of the Champions League encompasses all that Scholes is and this is definitely one of his best in a United shirt. Researching and finding all of these goals is making me extremely nostalgic. Scholes is going to be missed severely. He really was the best striker of the ball from outside of the box and this example from Everton was just another time where he managed to pick up the ball from midfield, run forward and blast an unstoppable rocket into the back of the net. Oh my word, I nearly forgot about this one. The ball looks like it is being pulled by a magnetic field into the back of the net. It is such a straight shot that the contact must of been as pure as water as the ball just rose perfectly into the top corner. This one is pure gold. “And with that, Paul Scholes become one of only 10 Manchester United players to have scored 150 goals for the club”. This goal came at the twilight of his career and reminded us why we grew to love the ginger ninja so much. The fact that he managed to creep into the top 10 all time goalscorer list for Manchester United rather quietly is a testament to how he set himself out as a footballer. Humble and modest, Scholes was always the consummate professional. The goal that sent every single United fan wild at the end of last season was the ultimate dramatic goal. At the time, this goal kept us in contention for a Premier League we lost to Chelsea by 1 point but circumstances are irrelevant. The poise and finish on a rare header from the diminutive midfielder showed just how good an all round finisher Scholes really was. A goal that may have slipped under the radar due to the plethora of other wonderful strikes that Scholes scored, this goal against Copenhagen was another textbook example of how to get over the ball and keep the ball at a good height on the strike. Skip to 30.30 to watch this goal. This took some serious detective work to find and it was definitely worth it. Much like Panathinaikos but on a lesser scale, this team move ended up with a fine Scholes finish that was worthy of the great football that preceded it. Skip to 5.05. Well, after seeing this goal on SSN tonight I cannot believe I did not remember it. Anybody who argues that Scholes did not have any dribbling ability with the ball at his feet can’t really contest with this great show of agile movement to skip through defenders before rifling in a fizzing drive to the opposite corner. Possible contender for my favourite goal now, easily. So there you have it. Given, there are probably a lot of goals that I missed but I am sure I got a lot of people’s favourites in the list. It still hasn’t sunk in properly that I won’t be seeing Scholes play next season. He is going to be such a huge miss. I trust in SAF to replace him but I think it will take more than one midfielder to fill the boots of Scholes, even if they are only size 7 (estimation). At least we will have endless footage to watch over with a smile knowing that we have witnessed the career of one of the best midfielders to have played in the red of Manchester. Place your votes on your favourite goals below and if I have missed any, make sure to say!